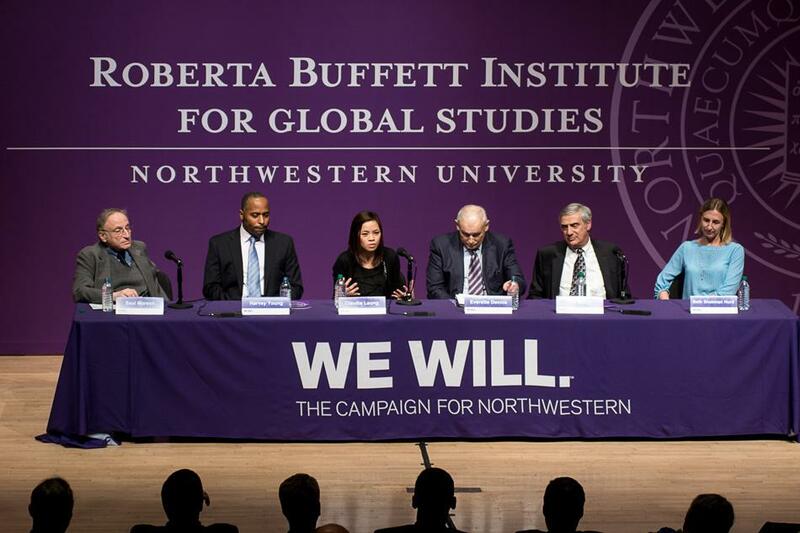 A panel discusses global issues at the January announcement of Roberta Buffett Elliott’s more than $100 million gift to Northwestern. The Buffett Institute for Global Studies is using part of that gift to expanded its scholarship and research programs. The Buffett Institute for Global Studies is giving more funding to students and faculty for international travel and expanding its research programs, following a more than $100 million dollar gift from Roberta Buffett Elliott (Weinberg ’54). The institute is expanding need-based scholarships for the Global Engagement Studies Institute, a global service learning program, and increasing its career development opportunities for undergraduate students. The institute has already partnered with the One Acre Fund to offer a two-year post-baccalaureate fellowship in East Africa scheduled to begin this summer. The One Acre Fund, which was founded by Andrew Youn (Kellogg ’06), works with small farmers to increase food production and reduce hunger. Weinberg senior Amanda Meyer, who works at the Buffet Institute’s Global Engagement Studies Institute, said the funds will allow more students to travel internationally. “They’re trying to reduce the financial barriers to study abroad and have interests in global engagement and international development,” she said. Sociology Prof. Bruce Carruthers, the institute’s director, said a large portion of Elliott’s gift has been “earmarked” for funding scholarships for international students, a move he says will support University President Morton Schapiro’s goal of having a larger international student population at Northwestern. Carruthers said that although the institute does not oversee international student scholarships, it is in charge of funding and developing other programs as well as hiring new faculty. The institute is also asking faculty to pitch large-scale, multi-year “big ideas” proposals. “What we’re encouraging our Northwestern faculty to do is to get together with other faculty to think about a collaborative, interdisciplinary project that could unfold over multiple years,” Carruthers said. Faculty can receive up to $50,000 each year for up to three years. The institute is also creating two-year postdoctoral fellowships in global, comparative or international studies. Another initiative, which Carruthers said will begin Fall Quarter, is the Buffett Prize for Emerging Global Leaders. The institute will recognize a global leader no more than 30 years old, who will be nominated by NU students affiliated with the institute. The winner, who will receive $10,000, will visit campus to lead workshops and speak to the NU community.